Last weekend, I went with my parents to Nates Honor Rescue in Bradenton FL for the first time. I recently lost my 13yr old Boston Terrier, Baxter. We started our tour and the first dog was Hazelton. 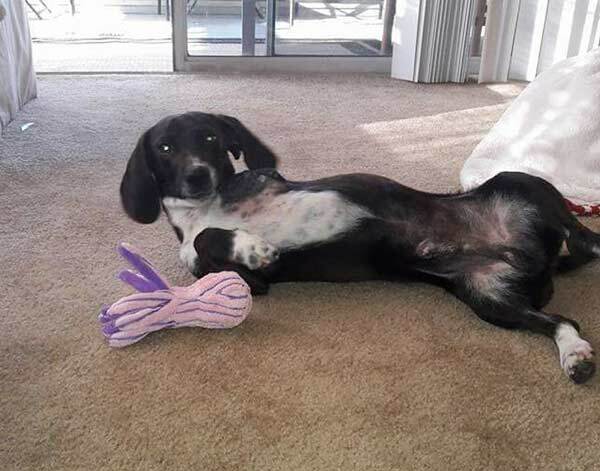 A sweet dachshund mix Tripawd. Oh those eyes!! They said he was found as a stray with a severe broken leg in Georgia about a month ago. As we were leaving we saw him in the play area with a family. I got back to my parents house and I couldn’t get him off my mind. My parents felt that same connection. The ranch was closed at that point so decided to email them and ask if he was still available. I got an answer right back that he was still there !!! I quickly replied back that I would be there when they opened. On that next day I brought my baby home. I named him ZIGGY. He’s such a Ziggy..He zig zags all around the house playing with all his new toys!! He’s so resilient!! His favorite thing to do is lay out on the lanai and wait for his new doggy friends. He made some good friends already. I did start crate training during the day but that first night I put him up on the bed…He snuggled for a few minutes and then went into the living room and pulled at his new orthopedic bed. I took the bed into my room. 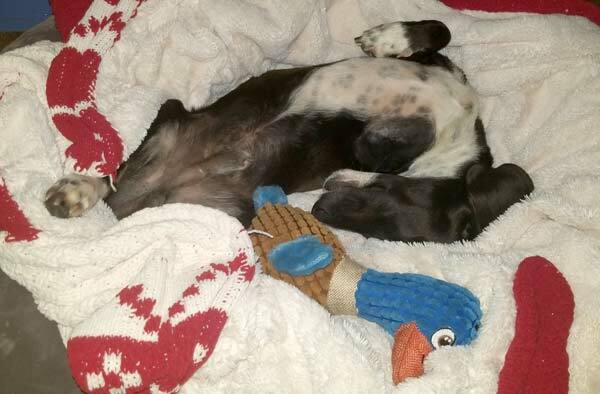 He got right in and slept all night long…feet in the air…not a care in the world. Since that night he sleeps in his comfy bed. I found out about the a Tripawd Rescue Fund when I googled harnesses for three legged dogs. 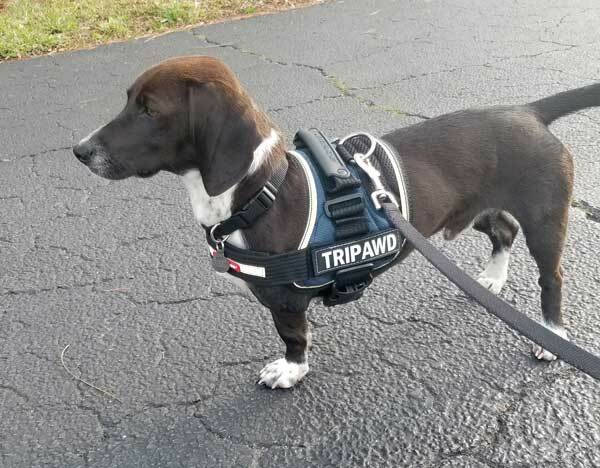 I got him a beautiful one through the Tripawds Gear website. You will see how adorable in the attached pictures!! 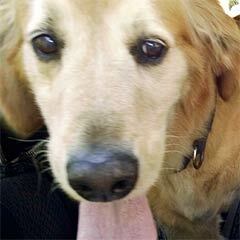 I took Ziggy back to Nates Honor on March 30th to pick up his paperwork. Remember I said my dog that passed away was named Baxter…Well, I looked where Ziggy came from and it said BAXLEY Georgia. I think this was meant to be!!! Thank you! I can see why you couldn’t get Ziggy off your mind. He is so look darn cute!! ADORABLE!!! Andnhe clearly knows hemis home. 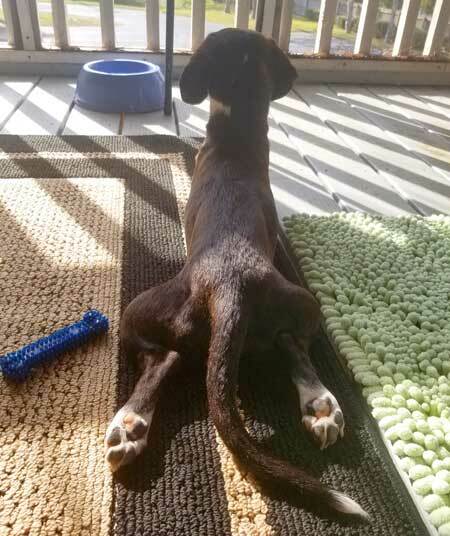 He looks so comfy on his ved and sunbathing on his deck innjos “frog leg” position. And he looks sooo handsome in his harness. Cute as can be!